Today’s Kidney Diet Veggie Lovers Cookbook is Here! Posted January 23, 2019 in Featured Post, News, Tips, Tags: davita cookbook, Today's Kidney Diet, vegetarian recipes kidney diet recipes kidney cookbook, veggie lovers cookbook by Sara Colman, RD, CDE. There’s no denying it—a vegetarian-style eating plan is getting lots of attention these days. In the kidney community, today’s kidney diet has triggered a change from the old kidney diet to a healthier way of eating. It includes more whole foods such as whole grains, legumes, nuts and plant-based protein sources. More kidney patients today are embracing meatless meals or vegetarian eating styles than ever before. It is possible to stay within your goals for sodium, potassium, phosphorus and protein on a plant-based diet. Your dietitian can provide guidance to help with a meal plan that meets your needs. If you are following a vegan or vegetarian eating plan, or considering eating less meat, check out the newest Today’s Kidney Diet Veggie Lovers cookbook. 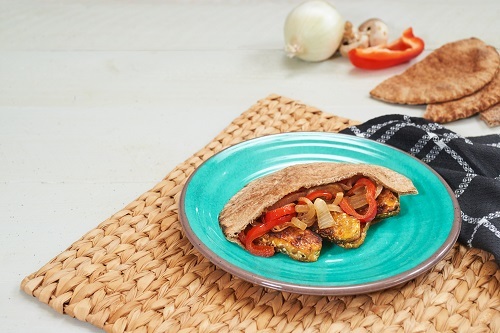 This collection of 14 recipes, from Arroz con Gandules (Rice with Pigeon Peas) to Tempeh Pita Sandwiches to Zucchini, Black Beans and Rice Supper, offers a sampling of kidney-friendly recipes that are sure to make you embrace your inner vegetarian! In addition to recipes, the TKD Veggie Lovers cookbook has helpful information on healthy vegetarian protein sources, potassium and phosphorus content of your favorite meatless proteins, and diet tips on making vegetarian meals a part of your meal planning. You will also learn about the health benefits associated with going vegetarian—and there are many! One of my favorite recipes from this cookbook is the Veggie Crumbles with Bowtie Pasta and Kale. Instead of ground meat, this recipe calls for soy-based veggie protein crumbles. For my meat-eating family members, this substitute has even gone unnoticed—or at least is acceptable. 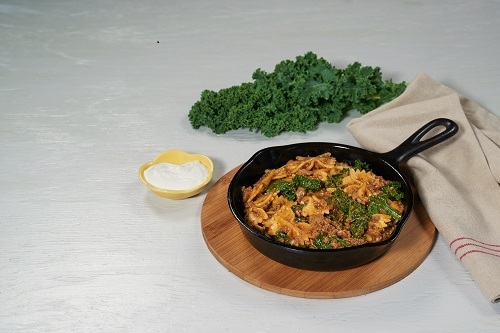 I also like that it’s a one skillet meal that includes kale and a touch of Greek yogurt to add creaminess and flavor. 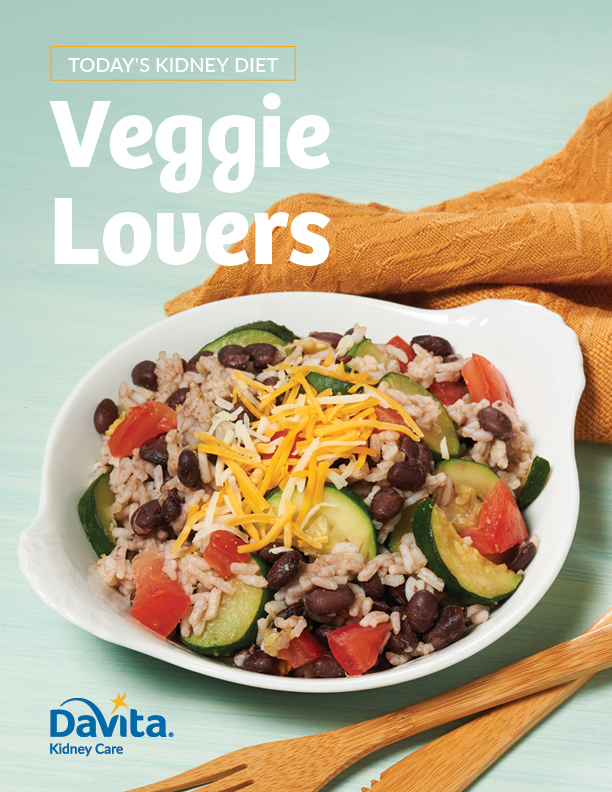 Download your copy of Today’s Kidney Diet Veggie Lovers cookbook today and start exploring these new kidney-friendly, wholesome recipes that are great for the whole family. Sorry, we only offer the cookbooks as a download. How many oz of meat, fish &/or seafood are allowable to stage 3 CKD patients? A general recommendation is 0.8 grams of protein per kg. The amount is individualized for each person based on weight as well as nutrition status and lab results. You may want to ask your doctor for a referral to a dietitian to get started with a diet prescription and meal plan. Then you can use DaVita Diet Helper to select a plan based on your individual protein and potassium prescription. My mother has End Stage kidney disease, she doesnot want to go on dialysis, is there any list of foods you have or renal diet for STAGE 5? It is best to discuss conservative treatment, including diet, with her doctor. Efforts to minimize build up of toxins and minerals like potassium may help. My husband is a transitional stage 4 kidney patient. He is not on dialysis yet, hoping to not have to start dialysis for years so we adhere diligently to his kidney diet, low phosphorous and potassium, so no beans etc. Yet your meals include beans, cheese etc. Please help me understand why I can give him these, wont they cause him to go into dialysis faster? What matters most is the total nutrients eaten and absorbed. It is definitely possible to include small amounts of beans, cheese and other sources of potassium and phosphorus without exceeding his daily goals. Try using DaVita Diet Helper online meal planner and tracker to track and compare his intake to daily goals. Also, naturally occurring phosphorus as found in legumes and whole grains are only partially absorbed, plus the fiber in those foods contributes to the healthiness of the diet. Where do I find the nutrition information for the recipes in the Veggie Lovers cookbook? We have included the nutrients on each recipe page in the cookbook. If you want to look up nutrients for a recipe you can use the DaVita Diet Helper My Creations feature to recreate a recipe and see the nutrients. Also, the recipes are from DaVita.com–we also have the nutrient values on the website. Was given to me by a dietitian that I was seeing for over a month. 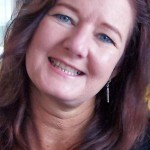 I have chronic kidney disease, stage 3. So are beans, legumes, nuts and whole grains now acceptable? Yes–research over the past years has shown that only part of the phosphorus in legumes and whole grains is absorbed. Also, cooking methods like pressure cooking and double boiling as well as buying canned beans and peas and rinsing can reduce potassium and sodium content. You may want to track what you eat using DaVita Diet Helper and compare it to your daily nutrient goals. Planning and tracking meals in this way gives you more flexibility compared to lists of what to eat and what to avoid. You are at the right place! You can search Kidney Diet Tips blog for any topic. You can also use the DaVita Diet Helper online meal planner and tracker to learn more about the nutrients in the meals you are eating. We also have an abundance of nutrition articles in the Diet and Nutrition section, including this article on Stage 4 Kidney Disease Diet: Focusing on Nutrition. Please share recipes or a cookbook that can be downloaded for a Type 2 diabetic who has e and , gluten intolerance, and stage 3 kidney disease. Gluten-free pastas, white and brown rice, and crackers cause bloating. Thank you. It will be appreciated! Go to the DaVita.com Cookbook page and look for the cookbook “Diabetes Diet Delights” designed for the kidney diet and diabetes. It is not gluten-free–but if you know how you can modify the recipes by substituting gluten-free grains, breads and products. The cookbook has a 3 day menu plan with a shopping list. I hope you find it helpful! I am very interested in just what I should eat to help my kidneys and most of all, what I should avoid. I am in stage 3 and believe that with proper diet I could avoid dialysis. The recipes are wonderful, I am already a good cook, just need to know what food items it is ok to have, especially vegetarian meals. I would like these lists of do’s and don’ts to be on the computer so I can either print it out or write it down, I really don’t need another kidney disease book, I have several and understand the disease very well. I came to a class back in 2015 and still have the folder given out at that time. Any help would be appreciated. By the way, I am going to be 80 years old this summer. Congratulations on keeping your kidneys working! Education and learning what to do make a big difference. I do not have a specific list–most of our lists are included in our Diet Nd Nutrition articles on sodium, potassium, phosphorus and protein. You could ask your doctor for a dietitian referral. Medicare covers the visit once your GFR is 50 or lower. If you use DaVita Diet Helper online meal planner and tracker, go to the Recipe Search section. One of the recipe categories is Meatless Entrees. Here you can find some great kidney-friendly meal ideas.